The keenest babies are now beginning to take their first steps. Even if your baby isn’t ready to do so yet, the world will be getting bigger for them every day. The urge to explore and experiment will be stronger than ever so make sure baby has lots of stimulating toys. Many of these can be easily made at home. 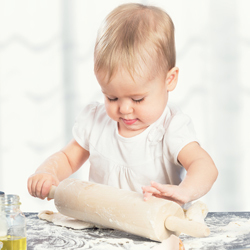 You can also begin to involve baby in cooking, which can be helpful in introducing new foods. The more they create, the more they will try. When you go outdoors, make sure you are well equipped for any adventure with spare nappies, soothers, toys, etc. And don’t forget high-factor sunscreen or wind and weather cream, depending on the weather. Sunscreen should be applied much more frequently than you would for yourself. And before you know, it will be time for the first birthday party! Check our birthday tips! 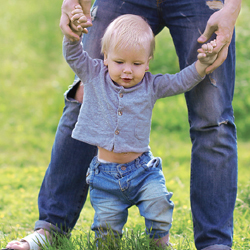 Some particularly keen babies will make their first steps before they even reach their first birthday. The couch in the living room may also serve as a walking aid here, but as soon as they make their first independent steps, this will considerably widen their sphere of action. This is a good thing because ultimately babies just want to be wherever they can. 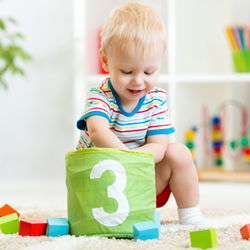 After all the rapid development made in the first year, you as proud parents will find that you have a real little personality on your hands with lots of little quirks, dislikes and favourite activities. 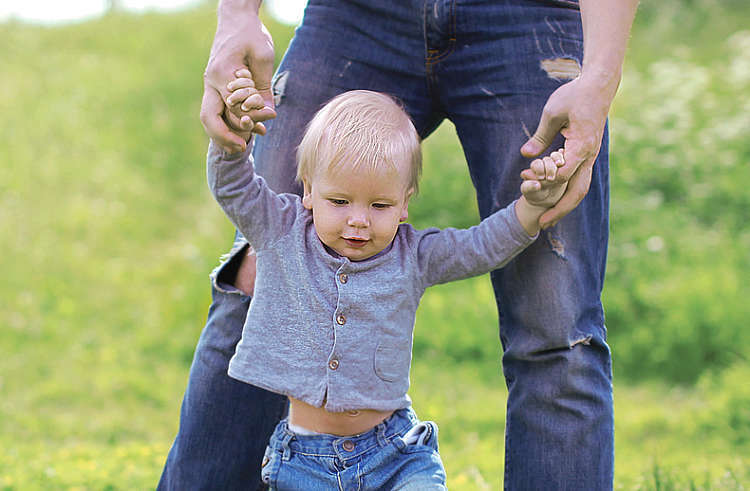 Tender, playful and perhaps slightly clumsy at times, the baby will soon begin the second year of his life and this is bound to offer just as much in the way of experiences and excitement as the previous twelve months. Learn how to play, right from the start! The new trend is for development toys. Babies are naturally inquisitive. They like to feel around, grab and taste things and they're always on the lookout for new impressions. They should be assisted here, with the right toy. New surfaces, exciting shapes, objects on the move, experimenting with loud and quiet, light and heavy: Ideal toys with these qualities don't have to be bought; you can make them very easily yourself at home. Safety tip: When a child is playing, they should always be supervised by an adult nearby. There is a good basic family rule for choosing the food and servings: The adults decide what there is to eat - and the children decide how much they will eat. It doesn’t hurt to figure in what will be well liked and a bit of fun to eat when shopping. Mashed vegetables or puree is boring. As soon as children can bite and chew, they would much rather do so when it snaps and pops. Being allowed to eat with the hand is more fun. So vegetable sticks instead of salad (carrots, cucumber, kohlrabi, etc. cut into sticks) served with yoghurt dip. Fruit is usually preferred over vegetables. The solution: both together. For example, green salad with grapes or apple slices with grated carrot. Children eat much more with their eyes than most adults. Serving creative, colourful dishes really pays off. This trick lets you easily serve less-favourite foods - like vegetables together with sausage or cheese on a skewer. Deco scores: If that healthy snack bread is colourfully garnished with radishes, tomato, cucumber or carrot sticks, it easily beats a sausage bread. Children are naturally curious and inquisitive. Whoever lets them help with the cooking teaches the pleasure of diversity and awareness for nutrition. A big hit with food: go along for shopping and be allowed to help choose. When doing so, most (older) children can already tell the difference between a smart choice and a - usually irrational - impulse purchase. Ensuring you are well equipped for any excursion. Travelling with a baby means being equipped to handle any event or eventuality. This is no mean feat! To make this task easier for you, we have put together a list of the most important items for an ideally packed baby changing bag. And we have also added some useful tips. A change of clothing should always be taken on any excursion; ideally always pack a complete second set. Baby changing equipment such as nappies, a baby changing mat, baby wipes and nappy cream are the basic essentials. Small bin liners and tissues are also advisable. Burp cloths, bibs, soothers – basics that belong in any baby changing bag. First toys are often more important than you would think, and baby's favourite toy in particular should always be a fixture in the buggy. Depending on the time of year, sun cream or in winter a wind and weather cream are recommended. A rain cover is also always an advantage to have. Feeding by bottle requires a little preparation. Ideally pack a small bottle, a Thermos flask containing boiled water and a powdered milk dispenser separately and then prepare the bottle for feeding directly when you need it. Important: Before preparing the bottle, wash your hands and test the temperature of the water! Little snacks are for older children or as soon as your child starts additional feeding. A walk outdoors in the open air is not just great fun, but is also good for our body. The sun stimulates circulation and helps us to form vitamin D. But too much sun can also become dangerous. In particular for babies and small children whose skin is still much thinner and more sensitive than adult skin. It is all the more important, on any trip out in the open air, to provide additional protection in the form of sunscreens and appropriate clothing. The most important rule for children is: avoid direct sunshine wherever possible – especially in the first six months of baby's life. But even after this it is advisable to stay in the shade at midday when the sun is at its strongest. This does not reduce the positive properties of sunshine – even just 15 minutes in the shade prevent any vitamin D deficiency. However, bear in mind that clouds and shade do not provide protection from UV radiation. Long-sleeved shirts and trousers as well as hats and sunglasses should therefore be worn even on cloudy days! 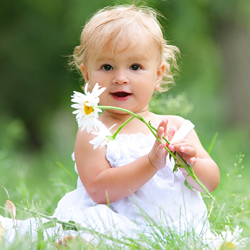 When babies are less than 6 months old, sunscreen is not advisable as babies' skin may still be irritated. With older babies, the best option is to use special children's sunscreens with a sun protection factor (SPF) of at least 30. This means that the skin's own protection time is increased by a factor of 30. The lighter the skin, the lower the intrinsic level of protection – the SPF should also be chosen accordingly. Sunglasses do not have to be expensive; what matters is a high level of UV protection. The darkness of the glasses is immaterial; it is much more about aspecial coating which blocks UV rays. Most children are very happy to wear sunglasses and so become acquainted with them from an early age. Avoid the midday heat: Try to stay in the shade between 10am and 2pm! Light cotton clothing: Cotton provides better protection than synthetic fibres, and dark clothing is better than light. Sunhat/peaked cap: Your child's head and neck should always be well covered. Sunglasses with UV protection: Look out for a label indicating the UV protection standard! Protect in the shade: UV light reflects in all directions, especially off water or snow. Change wet clothing: Wet fabric lets almost twice as much UV radiation through as dry fabric. Be careful in the wind & water: Although water and wind are cooling, they do not reduce the UV radiation. Apply plenty of sunscreen: Do not forget your ears, the soles of your feet and the area around your eyes! Has a whole year passed already? A great reason to celebrate! Pay attention to a few things and the party'll be a great success. Even though the little ones might not yet understand what they're celebrating, they still like a good party. They enjoy the excitement and the great vibe – and particularly the fact that all the attention is on them. The invitation: a blank canvas to be creative on – see also "First announcement". One nice touch is to provide a little photo montage chronicling the first year of the baby's life. The guests: less is more. One rule of thumb for children's birthday parties is that however old the child is, this is how many other children should be at the party. Lots of attention from adults is most welcome – the parents sending out the invitations can decide how many guests to invite here. 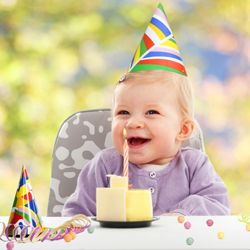 The catering: a good cake will go down better with the adults than with the one-year-old child – the baby will prefer the food he is used to and able to digest easily. The presents: the child will not yet make the association that birthday = receiving presents. Babies always like suitable toys, but this might be the occasion for presents that the parents will enjoy receiving. The event: there's no need to put on any elaborate entertainment ranging from a buffet to an assortment of games. The baby's very first party works best if all the adults lavish lots of loving attention on the little one.